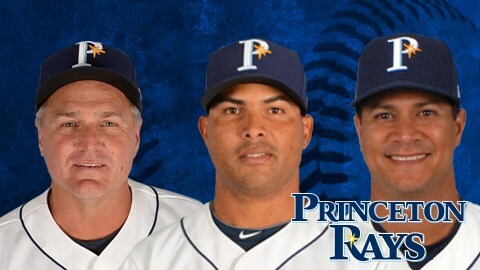 The Princeton Rays' along with their parent club, the Tampa Bay Rays', would like to announce the coaching staff; manager- Danny Sheaffer, pitching coach- Jim Paduose Gonzalez and hitting coach- Wuarnner Rincones will be returning for the 2017 season. Two new additions to the staff will include pitching coach - Jim Paduch and coach Rafael Valenzuela, trainer - Ruben Santiago, strength and conditioning - Sergio West, clubhouse manager - Ruben Allende and video intern Michael O'Toole. Danny Sheaffer, 55, who has led the Princeton Rays' to consecutive Appalachian League playoff appearances over the past three seasons, will return to manage the team for a fifth straight year in 2017. As a player, Sheaffer, played parts of seven seasons in the majors primarily as a catcher for Boston, Cleveland, Colorado, and St. Louis during a ten-year span from 1987-1997. He was the number one selection of the Boston Red Sox (20th overall) in the 1981 Major League Baseball amateur draft. He began his coaching career in 1999 and managed at all levels in the minors before joining the Rays' organization in 2013. The Princeton Rays' have been the proud Appalachian League affiliate of the Tampa Bay Rays' since 1997. Anyone needing more information can contact the team either by e-mail at princetonrays@frontier.com or by calling the team office at 304-487-2000.